So what if things are going badly, you’ve only got a few small coins left and are in desperate need of a Pentel mechanical pencil? Well you’ve basically got three choices - Carnival, Planetz or EZ#2. The Pentel USA website sells these three direct for US 50 or 51 cents each, but if you search around other websites you can easily get 10 to 25% discount for box lots. Probably more again if search really hard, or buy more. 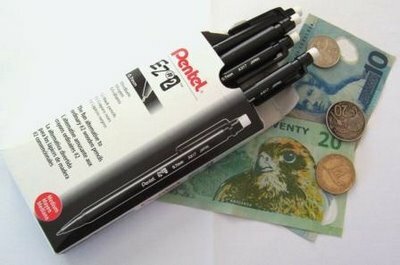 So, just what do you get for pretty much the least amount of money you can spend on a Pentel? Well this time round I chose the EZ#2 rather than the Carnival or Planetz. I understand that “Number 2 Pencil” is drummed into many an American head at an impressionable young age, so the EZ#2 is obviously Pentels attempt to attract sales by association with the Number 2 Pencil. 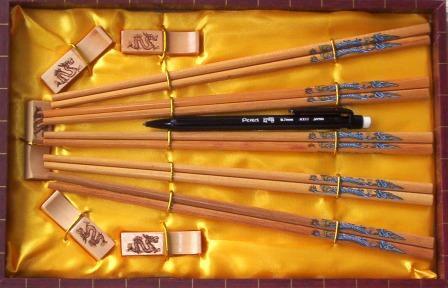 The “#2” is printed prominently on the body, and the back of the one dozen box notes they are “equivalent to #2 wooden pencils and never needs sharpening”. As you would expect from Pentel this is a good piece of plastic moulding, irrespective of the price. The body is a hard strong shiny plastic, not flexible at all. You can give it a really good bend between your hands and there’s no flex at all, and it doesn’t feel like it’s about to snap either. It is very lightweight as you would expect, but a normal length and diameter. Printed on the barrel is “Pentel EZ#2 0.7mm AX17 JAPAN”. Being silver on black, this printing really stands out. The whole pocket clip top section pulls off to allow you to refill the leads. The narrow lead magazine tube will only hold a couple of leads at a time. The clip section is a friction fit onto the lead tube – I guess it will hold together for an acceptable length of time. If the friction fit between the clip section and the lead tube failed then the whole top clip section would come apart from the barrel, and that would send the pencil to the rubbish bin. You cannot put the clip section back onto the tube without activating the lead advance mechanism. Being a separate moulding does allow the pocket clip to get reasonable pressure against the body of the pencil, so it’s actually quite functional. There is an uncovered eraser on the top. Covers cost money, and I suppose the uncovered eraser is a little reminiscent of a woodcase number 2 pencil. The eraser is the standard Pentel PDE-1, but is surprisingly good, better than others I’ve tried so maybe there has been a formulation change or something? The plastic lead sleeve is short and tapered so this pencil is not for draughting work at all. However it is fully retractable so it’s nice and pocket friendly. It is a 0.7 mm pencil, “for general writing” according to the sales blurb on the box. The lead mechanism has a good firm action - reliability is really a given seeing this is a Pentel. One thing of interest is that the front tip section is a push fit onto the body, with some moulded clips holding it in place. Probably makes for faster automated assembly than the more common screw on front sections. There is no special grip section or moulded in grip enhancements, so the pencil can get a little slippery with use over time. Best Points – The price, and I really do like that silver on black printing. Not So Good Points – Seems a bit tough to list anything here bearing in mind the price you pay for this pencil. Dimensions – Length 145mm, diameter 9mm. Former bookkepper. Current liberal arts student. Use bic yel twist mechanical pencils. The pentel popped up in my bag. I dunno where from, but I like it and am gonna buy some. Thanks for the info.